All girls at Hanford start to learn a modern language from Year 3. French is the key modern language taught at Hanford but by no means the only one. Italian, German and Spanish are also on offer. The department, through a range of visiting teachers, can arrange for the teaching of additional languages. The children receive 4 lessons and complete one 30 minute prep per week. 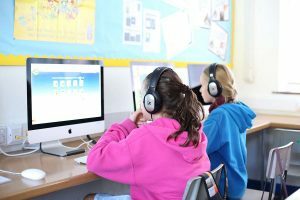 Progress is regularly assessed, with formal examinations set at the end of the Christmas and Summer Terms, and mock examinations for Year 8 at the start of the Spring Term. Learning a language isn’t just about being able to order a coffee while on holiday in Provence. The Modern Languages team at Hanford encourage the girls to gain an insight and understanding of other cultures through their language, entertainment and literature. The girls will read books, watch films and television programmes in French. In addition acquiring even the basics of another language can help with building confidence, understanding grammar and logic. There are two residential trips to France organised each year. We have a three day cross-curricular trip in Year 6, where we stay on the delightful island of Tatihou. There are lots of opportunities to practice French as well as other educational activities on the mainland nearby. In Year 8 there is a five day trip, most recently to Normandy, but Paris and Burgundy have been other destinations. This trip takes place shortly before the CE Speaking Test and is an enjoyable way of doing some final revision and preparation. It is also a special time for the girls in their final year as they get to spend time together off-site, experiencing the life and culture of France.